Okinawa, Japan, November 10, 2010 — Dr. Nakashima and Dr. Satoh of the Marine Genomics Unit of the Okinawa Institute of Science and Technology (OIST) and their colleagues have elucidated, at the genetic level, the mechanism by which certain types of plankton synthesize the fibrous polymer known as cellulose. Cellulose is the most abundant organic material on Earth; it has attracted keen attention for its potential for effective application as a promising clean biological resource with a low environmental load. Due to its microstructure, cellulose has strength (Young's modulus) that is comparable to steel. Native cellulose exists in a nanoscale crystalline ﬁbrillar form (microfibril); this structural feature is an important contributor to its strength. However, the mechanisms contributing to the crystalline formation of cellulose remain unknown. The researchers have demonstrated that appendicularians, a species of zooplankton, form structures by skillfully controlling the crystalline structure of cellulose. In particular, Oikopleura dioica, a type of appendicularians, constructs two distinctive forms of crystalline cellulose at the fundamental, unit-cell level of the crystal. 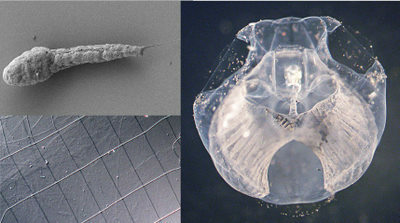 One form appears in the body cuticle ﬁns found in larvae; the other is a spherical structure termed the “house,” which appears in adult animals. The appendicularian uses the house structure to feed itself by filtering seawater (Picture). Oikopleura dioica has two cellulose synthase genes, each of which is responsible for constructing a specific type of crystalline unit cells. Thus, a molecular control mechanism accounts for the formation process of the crystalline structure of cellulose. This mechanism had been theoretically predicted, but had not been discovered prior to this study. This discovery provides knowledge that will be indispensible to the establishment of methods for synthesis of cellulose that is controlled at the crystal level. Such methods will enable a giant leap toward the effective utilization of cellulose resources. Appendicularians are abundant in the ocean around Okinawa; these research results are expected to contribute to the promotion of Okinawan industry that exploits native marine organisms. This research was conducted by a team led by Dr. Nakashima of the Marine Genomics Unit of OIST as part of the Center of Excellence Establishing Project launched by Okinawa prefectural government this fiscal year for the Development of an Intelligent Cluster in Okinawa. The results of this research have been published in the electronic edition of an academic journal in natural science, Cellular and Molecular Life Sciences. Top left: An electron micrograph of an Oikopleura dioica larva. It is composed of the body and the tail, a common formation to vertebrates called a “tadpole larva.” Cellulose fins can be observed on the rear-end portion of the tail. Right: An Oikopleura dioica adult covered by the house. A complex structure can be identified inside the house. Bottom left: A magnified view of the mesh structure inside the house. The house is an excellent filter that allows the adult to effectively collect micron-sized food found in seawater.